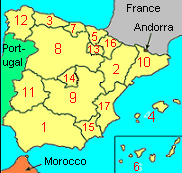 Here are all the seventeen Spanish regions or "Comunidades" (as the Spanish call them), and where they are geographically located in Spain. Click on the regions listed beside the map for a little more info about each region and cities within them. Remember these are the Spanish "Comunidades" similar to our Counties, the Spanish also have Provinces then Cities within these regions. Even more confusing some Regions, Provinces and Cities all carry the same name with Madrid being the best example!